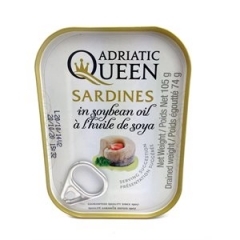 Home > Seafood/Snails > Adriatic Queen Sardines in soybean oil. 105gm. 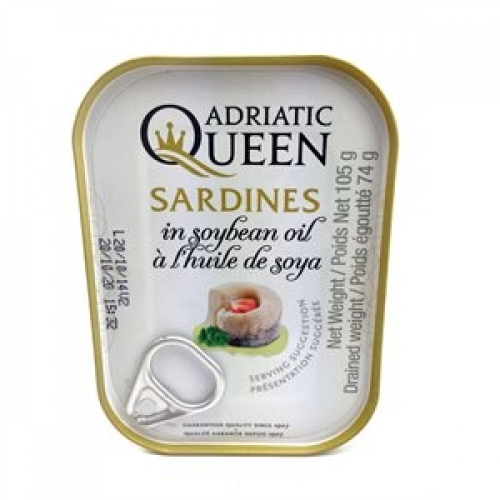 The year 2013 saw the completion of an extensive investment into a new production plant and the launching of Adriatic Queen, a new brand of canned fish products, which marked the beginning of a new era in the company’s business activities. The superior quality of Sardina’s products has now been further enhanced with new state-of-the-art manufacturing technology and improvement of its business processes. This is why we decided to develop a new brand of products and offer even better and healthier food to our customers. The new brand is produced in our new plant with the use of the latest technology – our products are still made according to hundred-years old recipes, but we are constantly improving their quality. Sardina is a leader on the regional market and a strategic supplier to all retail chains in the region. Our brand Adriatic Queen is sold on markets throughout the world, from European countries to the USA, Canada and Australia.